DA Form 3499 - also known as the "Application For Relief From Court-martial Findings And/or Sentence Under The Provisions Of Title 10, United States Code, Section 869" - is a Military form issued and used by the United States Department of the Army. The form - often mistakenly referred to as the DD form 3499 - was last revised on July 1, 2014. Download an up-to-date fillable PDF version of the DA 3499 below or request a copy through the chain of command. For use of this form, see AR 27-10; the proponent agency is TJAG. 10 USC 869 AND 3037. To appeal your court-martial findings and/or sentence to The Judge Advocate General under the provisions of Article 69(b), UCMJ. To evaluate your appeal and aid in determining whether the relief sought is appropriate. and may result in incomplete evaluation of your appeal. 10. I BELIEVE RELIEF IN THE ABOVE NAMED COURT-MARTIAL IS JUSTIFIED BECAUSE: (State fully the reasons you believe relief should be granted. (including accompanying matters submitted) ARE TRUE [SO HELP ME GOD]. I MAKE THIS ASSERTION UNDER THE PAINS AND PENALTIES OF FALSE SWEARING. will seldom be sufficient to warrant relief. or the appropriateness of the sentence." order(s), if available to the applicant, should be submitted with the application. established to the satisfaction of The Judge Advocate General. 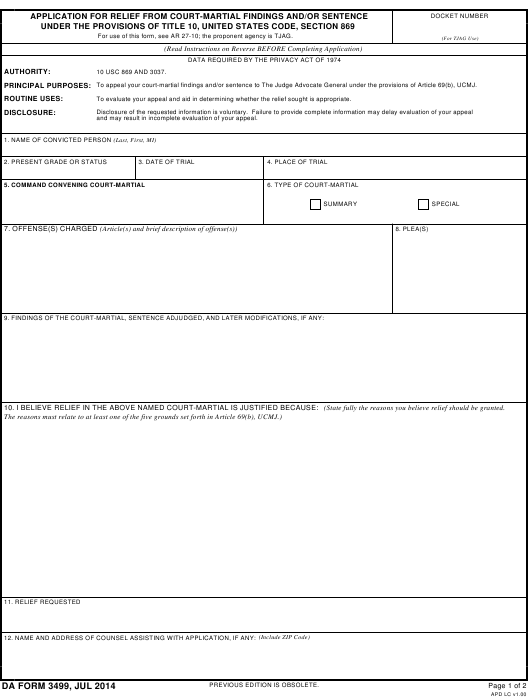 581.3 (Army Board for the Correction of Military Records). by The Judge Advocate General of good cause established by the applicant. 10. Submit only the original of this form. 11. Type, or print all entries in ink. vidual convicted, full explanation should be made and attached. 13. Complete all items; if inapplicable, enter "None". notary public is usually authorized to perform this function. 136(a) of the Uniform Code of Military Justice to administer oaths. General, and the result of review, when completed.